Still frame of visualization set to music and voices as part of the Hearing Seascapes performance installation to premiere in the Qualcomm Institute IDEAS series on February 8 along with a second installation related to coral reefs, Erasure. In spring 2017, UC San Diego music professor and former Qualcomm Institute (QI) composer in residence Lei Liang, and Falko Kuester, the institute’s professor of visualization and virtual reality, organized a unique seminar course on “Hearing Seascapes: A Collaborative Seminar on the Sonification of Coral Reefs.” It provided graduate students, primarily from the Music department, with an opportunity to develop multimedia projects to highlight the dangers facing coral reefs in many parts of the world. Hearing Seascapes, which combines coral-reef imagery and audio data to generate sound based on the location and viewpoints of endangered coral reefs. The work was co-developed by Lauren Jones, a Music graduate student in Vocal Performance, and Music Ph.D. student Eunjeong Stella Ko, both at UC San Diego. Hearing Seascapes will be staged in the SunCAVE virtual-reality (VR) room in the Immersive Visualization Lab, and Erasure in the Reconfigurable Media Lab, both on the first floor of QI’s Atkinson Hall. The works will premiere Thursday, February 8, 2018 from 5-7 p.m., followed by a public reception. Starting at 5:30pm, Music professor Lei Liang will introduce a series of short talks by the artists behind both works. 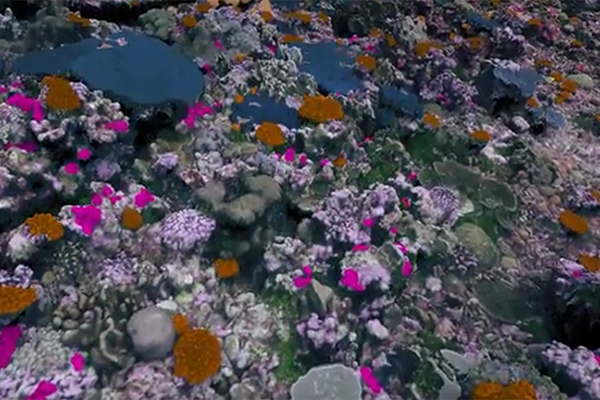 Through an interconnected network of three-dimensional (3D) photomosaic models of coral reefs and spatially as well as electronically processed percussion sounds, a metaphorical ecosystem forms and responds directly to human presence and the temporal history of that presence throughout the work’s existence. 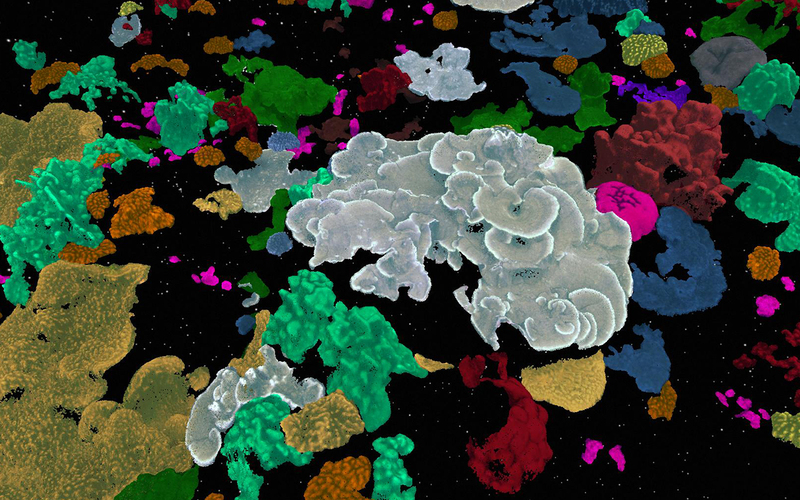 The visual component of Erasure consists of 3D photomosaic models of coral reefs taken from the 100 Island Challenge, based in the Scripps Institution of Oceanography. These digital reproductions were created by the Challenge’s technical visualization advisors from the Qualcomm Institute’s Cultural Heritage Engineering Initiative (CHEI), jointly with Scripps Oceanography. By rigorously photographing and collecting data from reef sites and rendering the data into 3D computer models using custom software developed by CHEI’s Falko Kuester and Vid Petrovic, students from the Music department were able to observe the reefs from various angles, light levels, and distances. The sound-space of Erasure is created from a reservoir of percussion improvisations that both reflect the sounds that might be found in and around a coral-reef environment, as well as poetic expansions that reach beyond the palette of oceanic utterances: scraped and struck limestone tiles, sweeping washes of hands streaked across a bass drum, and the murky drones of rolled bell plates. By manipulating these samples in a simple causal network, emergent behavior materializes to constitute a lush atmosphere of sound. In this way, the behavior of the sound world is not unlike the behavior found in reef ecology: masses of small units combining to create a complex and rich environment. Viewers use a joystick to ‘dive’ and explore the reef, controlling the location, viewpoint, depth and speed of navigation. Audience members hear different sounds that represent different species in the data set. Each species has its own specific personality (represented by different sounds). “Coral reefs are living, breathing organisms that are vulnerable to small changes of the surrounding environment and climate,” explained Stella Ko. “We assign the coral reefs a distinct personality by examining certain characteristics such as texture, habit, origin and growth. To convey messages through music, we’ve recorded an underwater dialogue of voices.” Indeed, the installation was designed to induce conversation between coral reefs and a fish maneuvering through the reefs, and the sound will become louder or softer depending on how far away it is from the coral. Jones and Ko set for themselves three goals with Hearing Seascapes: to display experiments with different aspects of sound and innovative graphic design to create an enjoyable environment for the audiences; to tell an effective and interactive story invoking concepts of adventure, imagination and humor to motivate people to recognize environment health; and to create an inviting seascape with a synergy of voices, images, synthesized sounds and human emotion.